Goutham Nanda was a rich man in Italy and grand son of Raghu Ram Nanda(Boman Irani). At the age of 80 Raghu Ram is not happy due to separated daughter Sunanda (Nadhiya) who refuses to meet him after he makes several attempts. So to reunite the family Goutham flies to India and joins as a driver for his aunt to convince her. Sashi and Prameela (Praneetha) are Sunandha daughters. What does Goutham do? whom he marry? Can he win the affection of his Atthayya? That forms the story of Attarintiki Daredi. Pawan Kalyan is stylish and he has good energy levels in this movie.Pawan kalyan as Aththapur Baba and dancing for Kevvu Keka song is awesome. Gowtham Ahalya comedy scenes between Pawan and Brahmi are too good. Pawan looked perfect and Powerful in all departments. His performance in the climax sequence is too good. Easily one of Pawan’s finest performances. Samantha is gorgeous and cute. Samantha shared sizzling chemistry with Pawan Kalyan. Watch the lovely song Ninnu Chudagane for Power Star and Samantha. Praneetha looks good and expressive with her eyes .Especially in the Bapu Gari Bomma song she looks pretty good. Boman Irani’s performance is outstanding. And Nadia, She truly did justice for Pawan’s Atta character and she really apt to it. Brahmanandam steals the show in second half. His performance as Oscar Bhaskar brings huge laughs in theatres. Brahmi performance in Ahalya drama scene is outstanding. Ali is good. Rao Ramesh is neat, Posani and others delivered decent performances. The story line of the movie is ordinary but the way Trivikram executed is different ,particularly in climax his direction is outstanding. Trivikram extracted nice performances from all the cast . As we all know that trivikram is famous for his one liners. You can find lot of Trivikram trade mark dialogues in AD. He included every ingredient comedy,romance ,emotions,drama ,fights in the movie with right proportions.Comparatively, second half has more of stuff, drama and humor than that of first half. Comedy scenes like Attar Baba and Ahalya dram can be watched repeatedly. 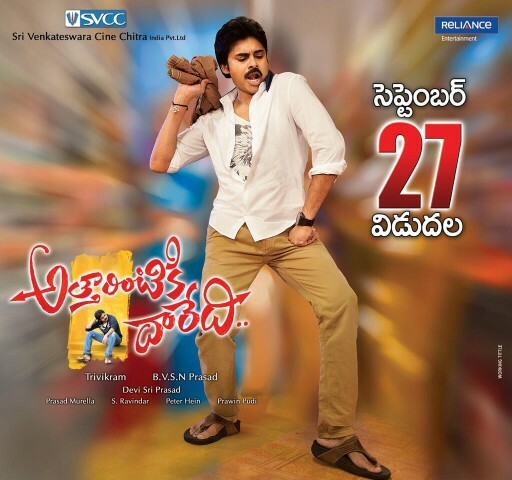 Pawan Kalyan ,Samantha chemistry as Bava maradalu is out standing. Screenplay is neat and with loads of entertainment scenes, audiences get engaged despite long run time. DSP music is awesome and also good on screen. Ninu chudagane, Bapu gari Bommo and Kirrakku songs are eye feast. Background score is impressive.Cinematography is a big asset for the film. VFX scenes could have been better. Production Values are rich.Pravin Pudi’s editing is good. Those who expect Gabbar Singh like Mass Masala will disappoint.Attarintiki Daredi is a clean entertainer to be watched on big-screens with your family.